These copies have a slight cover dent in the corner - due to mispacking when shipped here. The damage is not too bad, no split seams, no major damage to the front, or back - just a very small crunch in the corner - but I prefer to sell these at a sale price. 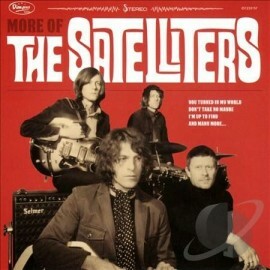 THE SATELLITERS are back with a new mind-bending take on 60s garage-punk called More Of The Satelliters. Like a MUSIC MACHINE entering the 13th FLOOR ELEVATOR, they paired nine original tunes with three classic garage-monsters in an all analogue-recording to create this new highly-recommended longplayer. You can´t COUNT V and it will have hit your nerves and mind, make you shake & shout & scream for more, more, more!! Unless you travel into the EXOTICS where “I Was Alone” and your record-player has a MUSIC EXPLOSION! Since 20 years THE SATELLITERS appear through THE SHADOWS OF KNIGHT to turn you on with their versions of beloved more or less known 60s-garage-punk-tunes like TY WAGNER`s “I´m a No-Count” and serve you with their remarkable and always impressing original songs “Don’t Take No Maybe”, “Come & See” or “It’s Gotta Be You”. THE SATELLITERS take no PRISONERS, but also are no MIRACLE WORKERS. They don´t need to be anyone else or KINKS, that´s what you know best! So, as the records come this time in an old-style tip-on-cover (yes, with the glued back-print), there is no time to wait - get your copy NOW!!! • Limited edition colored vinyl! • Old style slick on board album cover! • This release celebrates THE SATELLITERS’ 20th anniversary!